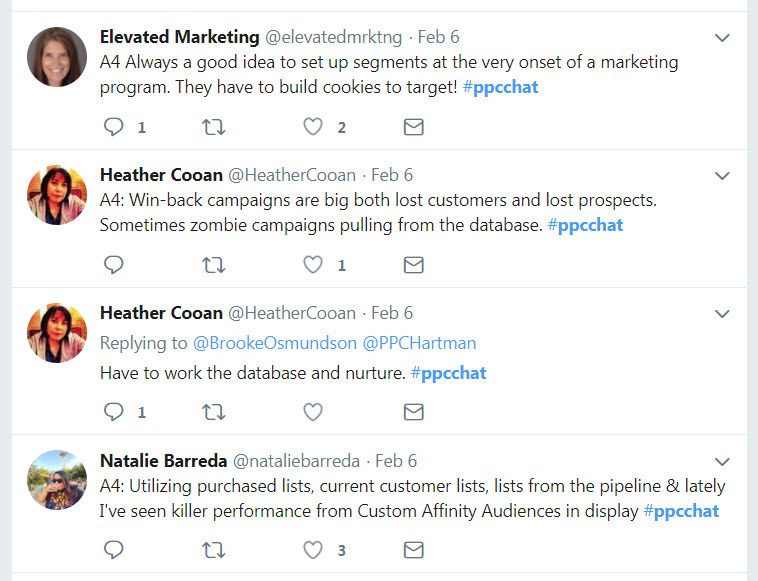 This week’s #PPCChat on February 6 was all about B2B PPC, a topic near and dear to my heart. It was a great chat, with lots of helpful information shared. 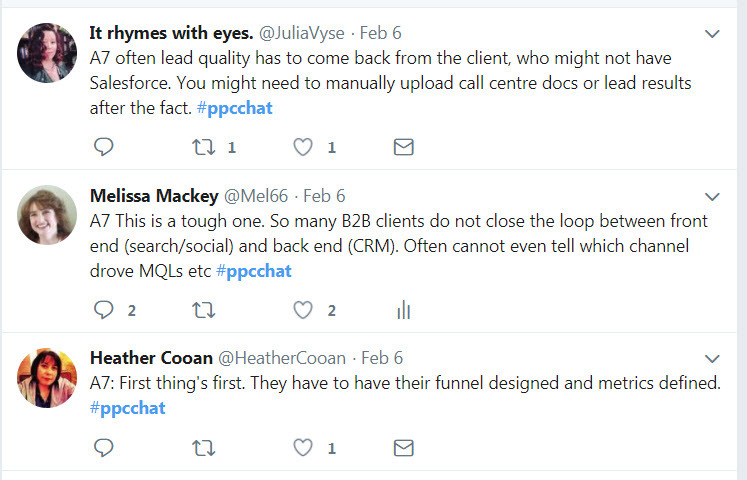 Here are a few keys to B2B PPC that came out of the chat. B2B isn’t the same as B2C. It may seem obvious, but it’s a distinction that I’m not sure the search engines understand. B2B PPC is usually focused on lead generation rather than a final sale. Leads are handed off to a sales team, or put into a nurture funnel. The buying cycle is long, making it challenging to close the loop from lead to sale. In B2C, personas are often irrelevant. Your customers are whoever buys your stuff. 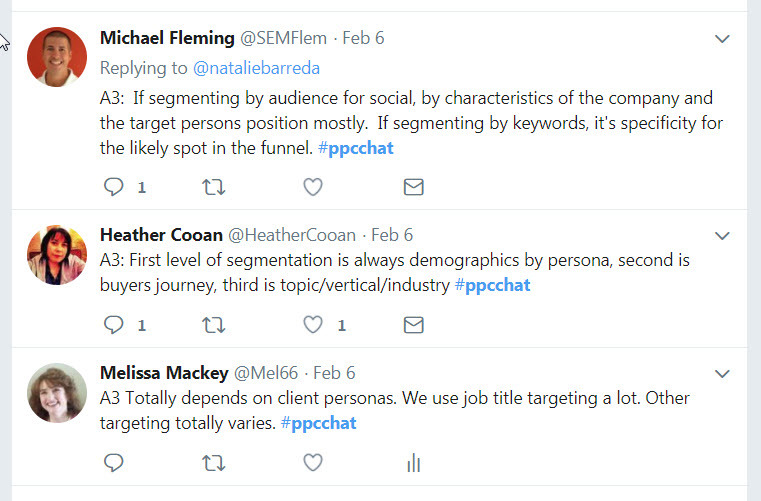 But for B2B, personas are important to understand, as they’ll drive a lot of your strategy – especially if you’re running paid social. Defining your personas early in the planning process will help you decide how to segment your audiences and content. Audiences are a great way to hone in on the B2B user. 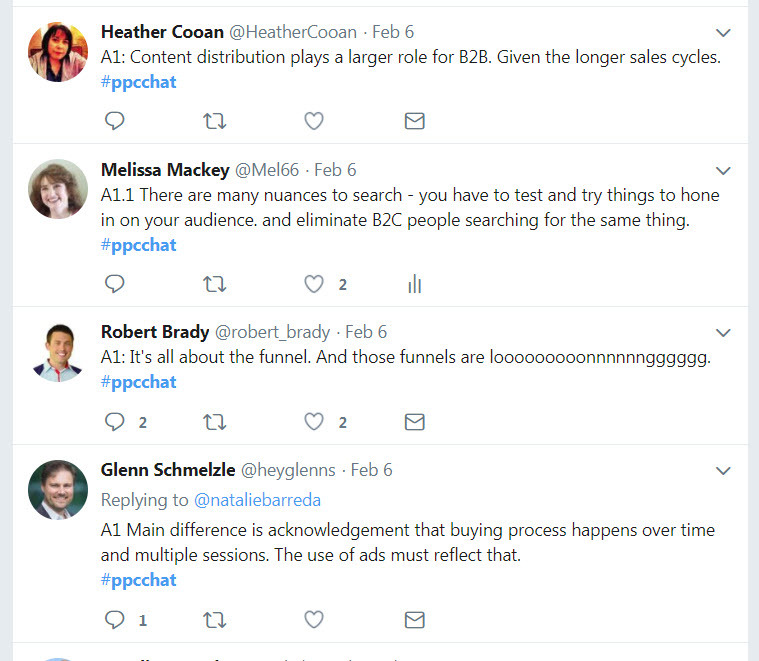 A lot of PPC Chatters mentioned audiences as a way to reach their target. While keywords are important, audiences are crucial to ensuring a successful B2B campaign. Spend some time researching your audience, and thinking about the best way to reach them. For upper funnel campaigns, content is king. You’ve probably heard the saying about digital advertising: Don’t ask the prospect to marry you the first time you meet. In other words, don’t hammer a first-time visitor with offers to buy, buy, buy! Nowhere is that saying truer than in B2B PPC. Users are not going to buy a six-figure piece of industrial equipment, or an enterprise software package, or whatever B2B businesses are selling, on the first go-round. Search is often taking place higher up the funnel, when people are just beginning to research solutions to their problems. Content is king for upper-funnel B2B PPC campaigns. You must have good content to sell your audience. B2B measurement is tough, but can be done. Front-end measurement for B2B PPC is easy: just slap Google Analytics or another package on your site, and you can track visits, user behavior, and even website conversions. The problem is, website conversions are usually not a purchase – they’re a lead. What happens to those leads once they convert online? That’s the loop that’s surprisingly difficult to close. B2B advertisers tend to be behind the times when it comes to tracking systems and processes. A shocking number of businesses are using old-school CRM systems, or even pencil and paper, to track leads. They have no idea what happens to them once they go to the sales team. I encourage you to read Heather Cooan’s tweets from this week’s chat on measurement. She worked in-house at a B2B organization for several years, and has great insights into how to make this work. In fact, I encourage you to read the entire tweet stream from Tuesday, February 6. 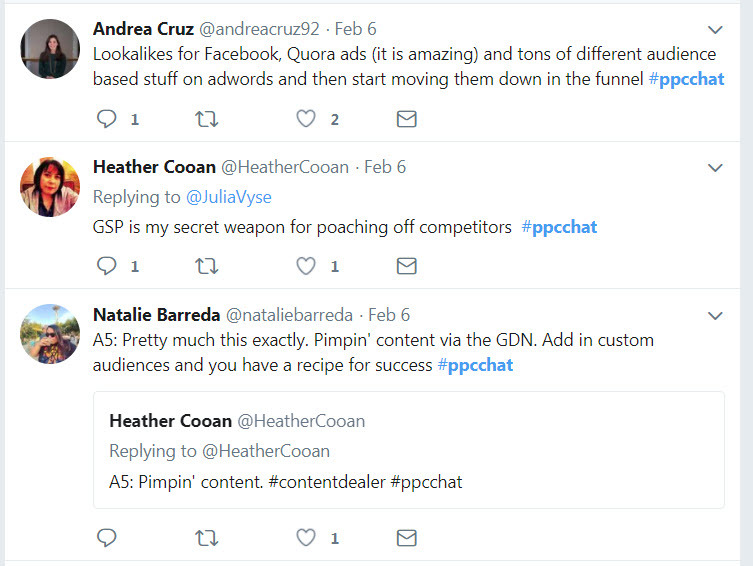 There are a lot of great nuggets about B2B PPC there. What’s your number-one key to B2B PPC success? Share in the comments!